Crazy day here in Kentucky. A strong line of thunderstorms just swept across the state like a firm pimp slap. I watched it rain in 3 different directions. Then we lost power, then the power came on and then the TV went out. Oh, and I couldn't find our battery radio or our War of the Worlds crank radio, thank you Tom Cruise. Needless to say it was pretty crazy. 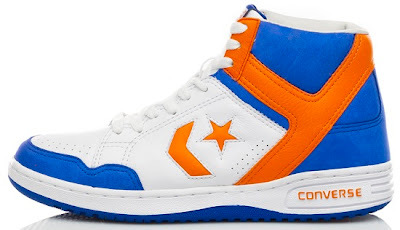 Speaking of crazy, these new Converse Weapon 86's are just that. You can them in a very nice Blue/Orange Knicks inspired colorway. Sorry for the late post today, I had to keep up with some crazy 5th graders. Besides the F'bomb and sneaky cell phone use, it was a rather pleasant day all around. Thanks for checking out the blog, enjoy the weather where ever you are! 'S Weapon Wednesday: Lady Weapon. Dwyane Wade All Star Game Wade Slash.